So here's a campaign that would never air in America. Why? Because we don't condone binge drinking and beat-the-clock style happy hour boozefests. But in Ecuador? No problem whatsoever. 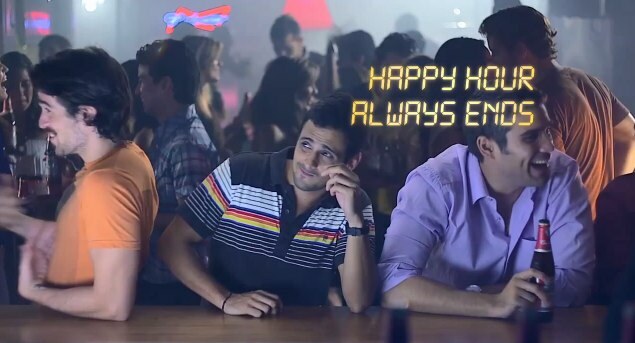 Y&R Ecuador developed a campaign called Budclock that resulted in the extension of happy hour by one minute for each Budweiser purchased (using QR codes, of course). In theory, happy hour might never end. We have to agree with AdWeek's David Gianatasio on this one. 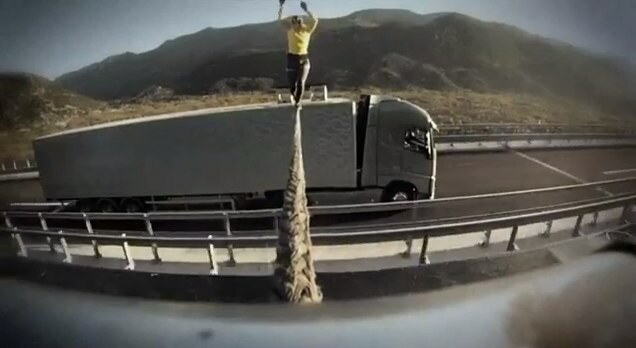 To "demonstrate the precision and control of the new Volvo FH series truck," Swedish ad agency Forsman & Bodenfors set up a slacklining stunt whereby slickliner Faith Dickey would walk a tightrope between two moving trucks approaching tunnels. 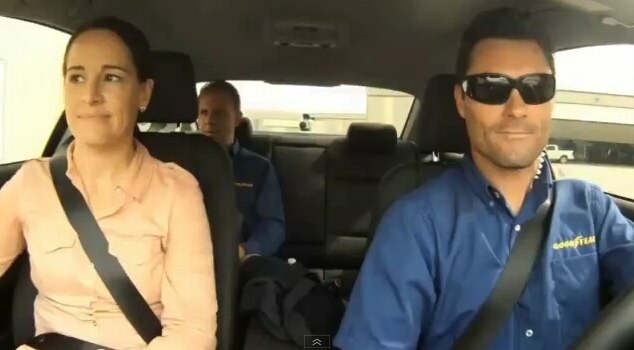 As with other stunts similar to this that attempt to illustrate the superiority of a machine or vehicle, as Gianatasio argues, it's really the skill of the operator as opposed to the technical precision of the machine that truly matters. Volvo could have grabbed two 20 year old 18 wheelers, a pair of great stunt drivers and accomplished the same thing. 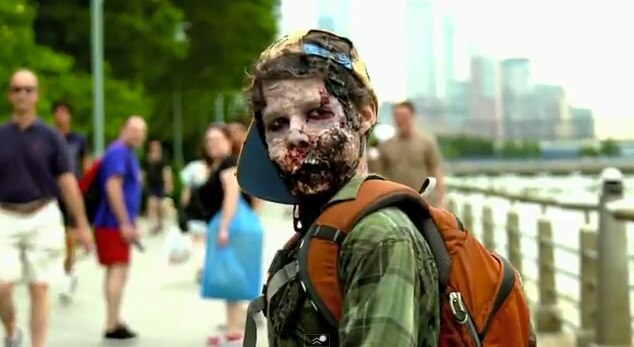 As part of its ongoing negotiations with Dish Network which dumped the network from its lineup, AMC has unleashed real-life Walking Dead zombies in New York City posing as EMTs, street workers, cops, pedestrians and hot dog vendors. Needless to say, the stunt scared the crap out of people but also brought a few laughs. Employing a unique strategy to pimp its vodka client, Ultimat, Amalgamated hired window washers, spruced them up a bit and sent them up and down the sides of high rises in New York and Chicago with placards urging workers to take a break, work less and join the brand atop the roof for a vodka-fueled party. Ingenious if you ask us. And quite successful. In just four short days, the video, which as we all know is the meat of the campaign (not the actual stunt), already has over one million views. 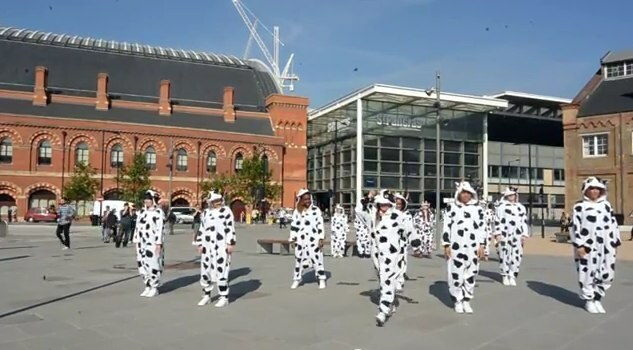 OK so not real cows but a bunch of humans - dance troupe Boadicea, dressed as cows getting their groove on at London's King's Cross Station. Called Supporting Better Dairy, the campaign is a partnership between Ben & Jerry's, Compassion in World Farming and the World Society for the Protection of Animals. Check out the video below and the accompanying website here. The work was created by Lee Washington. What Would You Do In Public For A Free Snack? It's always amusing to see how far people will go to get something for free. Or, more accurately, what they're willing to do in public in response to a marketers guerrilla shenanigans. 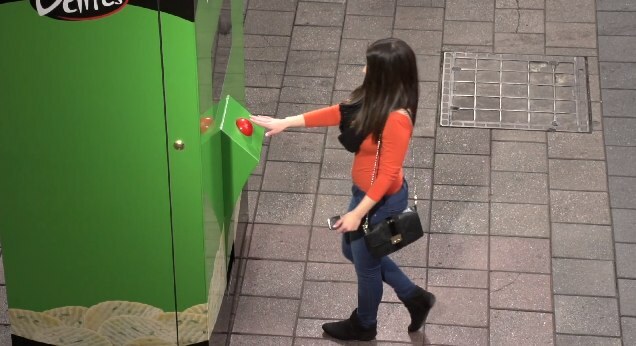 Recently, BBDO Adelaide asked Australians to perform a few tasks - from pushing a button to dancing to kneeling and bowing to "the almighty one" - to receive some treats from a Fantastic Delites vending Machine. Apparently, this is just the beginning. The video ends with the text, "Did they go far enough? To be continued..." Which basically guarantees we'll be seeing more shenanigans soon enough. 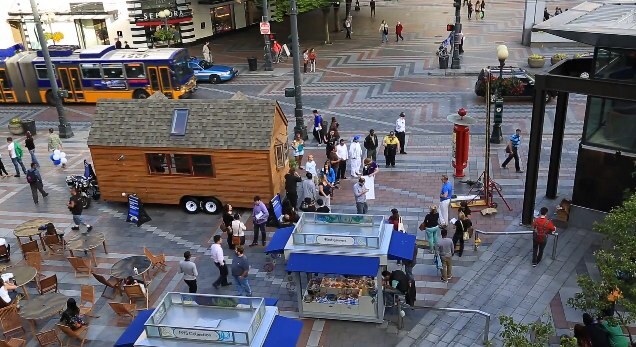 Australian bank NAB is at it again with its ingenious stunts. 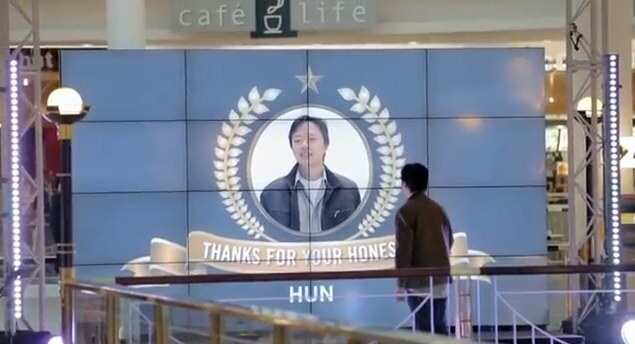 This time its rewarding honesty by instantaneously launching real-time campaigns to thank people who found and returned objects in a mall. 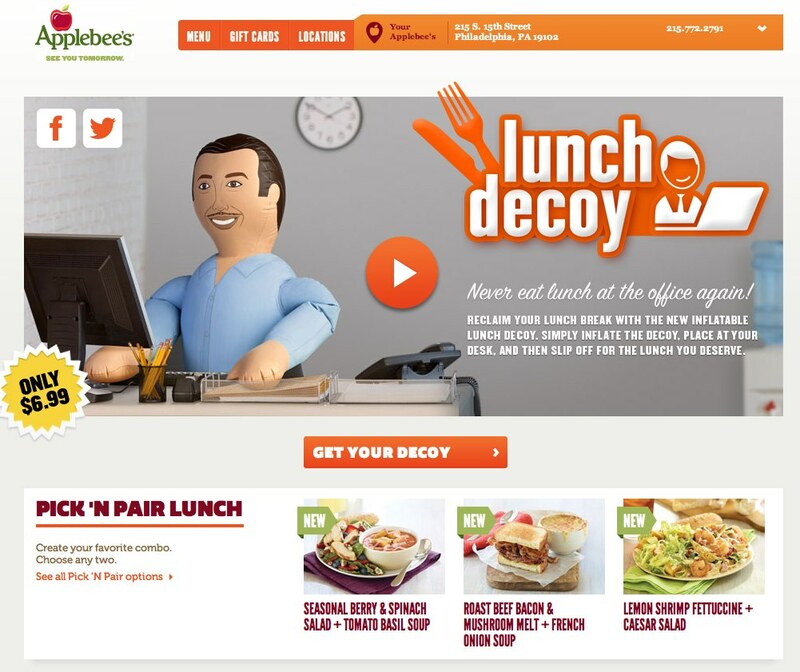 After returning the object, stunned shoppers begin to see their likeness pop up on posters, dioramas and even on the top of a cake. Check out the video. It's all part of the bank's ongoing focus on honesty which kicked off a year or so ago when it set itself apart from other banks by hanging its hat on the notion of honesty. The campaign is the work of Clemenger BBDO Melbourne.